By Zac Crain | 2 years ago Imam Omar Suleiman, with his charismatic sermons and message of inclusiveness, has gained a national following. That’s why ISIS wants to shut him up. 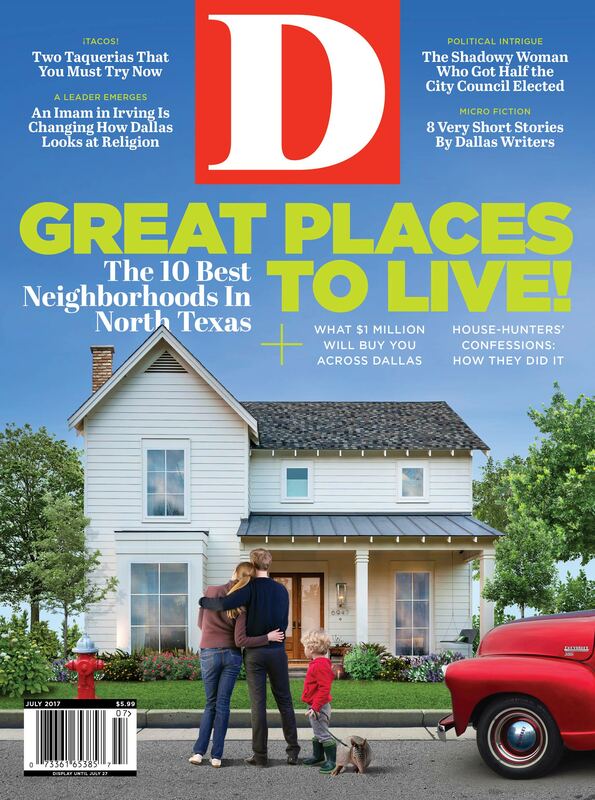 By D Magazine | 2 years ago The West Plano resident shares what she loves most about Dallas. By Alice Laussade | 2 years ago I wanted water balloons. She wanted to save my soul. By Abi Grise | 2 years ago After her move to the city, this woman's worst nightmare came true. Rather than leave, she started running. By Annie Wiles | 2 years ago The Eagles leader celebrates in his adopted hometown. By Christiana Nielson | 2 years ago It's still about eliminating the enemy but with a focused assault. By S. Holland Murphy | 2 years ago Take a look at the possessions of the city's elite, from teeth to ashtrays. By Catherine Downes | 2 years ago A new take on summer drinks. By Peter Simek | 2 years ago Forrest Kirkland made some of the most important paintings in Texas' history, rescuing centuries of rock art from oblivion. By Eve Hill-Agnus | 2 years ago Fino Rodriguez has created a tiny gem that will draw even more people to West Dallas. By Caitlin Clark | 2 years ago Keep your cool in the Texas heat. By Krista Nightengale | 2 years ago The work is at the intersection of Lemmon and McKinney avenues. By Caitlin Clark | 2 years ago The Australian skin and hair care brand brings three stores to the city. By Caitlin Clark | 2 years ago High fashion hits Deep Ellum with the boutique's arrival. By Tim Rogers | 2 years ago The always interesting councilman returns for what should be an interesting sequel on the Dallas City Council. By Eve Hill-Agnus | 2 years ago You'll see why through their hand-pressed tortillas and an ambitious tasting menu. By Emily Esleck | 2 years ago Whiten, brighten, and recuperate with this captivating health and beauty trend.